A silvery figure padded through the ruins, looking as out of place as a piece of snow in a humid jungle. Her green feathers barely helped her with camouflage even though they were longer than average. Black scars criss crossed her body and the only part of her without scars was her tail and her right hind leg. Her left hind leg was held off the ground and she moved with a three-legged gait as fluidly as any other canine would. A black cord held a silvery ankh with wings around it and a worn satchel clinked with every movement. Avinalora wouldn't say that she enjoyed living in such mountainous terrain since she wasn't that much of a climber with her small size and three working legs. She was lucky that most of the herbs she needed grew near her clinic and she was able to cultivate ones that normally grew further away in a small garden such as Paniculta, woundwort, white wormwood, V Balm, and Robert's Geranium which was not an easy feat. 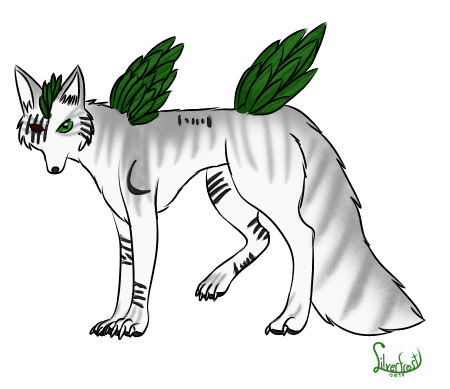 The moon-washed medic padded along the forest floor, looking for herbs to gather, her sharp teeth or claws making quick work of the stems. She plucked sprigs of feather-shaped leaves from a yellow-flowered shrub and placed it into her satchel. She went on to nip off stems from a large shrub that looked something like Rosemary. "You wanted these?" A silver pine marten appeared from the trees, a collection of golden orange fruits hanging from a branch in her mouth as a sprig with small green fruits. Yes, thank you, Eklumis. the monochrome Cardinal said and the pine marten dropped them fruits into her satchel before hopping onto her back. The pair padded through the trees, still searching for more herbs to collect.